It started out like normal, a guy who lived with several generations of his family needed a way to make his house bigger so everyone could be comfortable. He didn't have enough money to hire a contractor, so he decided to do it himself. All he planned on doing was a simple knocking down of a wall in the basement and a build-out of another room. Simple, right? The wall he was taking down was a stone one, so it was taking a bit more effort than plaster, but it was fine because he wasn't paying someone to do it. He had gotten started and realized that as he removed more stone, an opening was appearing behind it. It was an old house, so maybe it was a room he had just not known was there before. As the hole got bigger, he felt a rush of cold air coming from the pitch-black behind the stone wall. He couldn't seen so he grabbed a flashlight, and stepped inside to look around. As he stepped inside he was disappointed to see that the room didn't have anything in it and was quite narrow. He did see that it continued farther on into the darkness though, so he followed. With the house being built in Turkey, the man was especially cautious of poisonous creatures that might be lurking down below. He definitely didn't want to get caught down there with a potentially fatal bite, but his curiosity took over and he soldiered on. Shortly after he entered the cramped passageway, he found himself walking into a huge room. He had found a hideout beneath his house. There had been other houses in the area who had found similarly ancient things beneath their houses, but not quite as grand as this. What set his discovery apart from the others, is that his was clearly engineered by humans. This wasn't just a cave someone turned into a temple, but a room that had been built by humans and clearly used as evidence of the smooth, worn down stone floor. He saw that the room was much bigger than he could see, and he was already this deep in, so he continued to travel across to try and find the exit. It was pretty terrifying, but he knew that he had to keep going. He explored the entire room, examining everything he could find. As he made his way around to the opposite side of the room from where he came in he found an opening in the wall. Maybe this was the exit! He walked through it to find an even more cramped walkway than the first one, one that only a singular person could walk into at a time. This almost instantly turned into a stairwell, where he had to crouch down as he walked due to the low ceilings. He followed the path through a maze of walkways and rooms and was just astounded at the discovery he had made. He, at some point, realized that he should probably make his way back home before he got lost forever underneath his house. He needed to be able to tell someone what he had found. As soon as he surfaced from his adventures, he made a call to the Turkish Antiquities Authority and let them know of his amazing discovery. They hurried over to take a look and were speechless. They were staring at what some thought previously to be a myth, straight in the eyes. 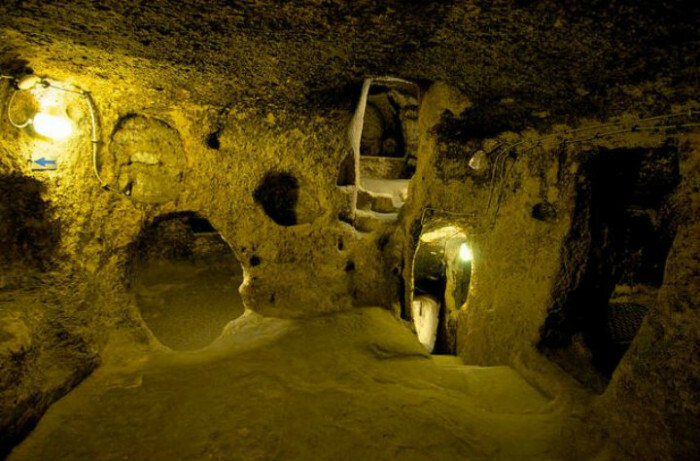 The man had found the lost, underground city of Derinkuyu underneath his house. On par with Atlantis and El Dorado in mythical status, this city began to be built in the 8th and 7th centuries BC by an Indo-European people called the Phrygians. It had started as simple, small caves but had clearly developed into something much bigger. 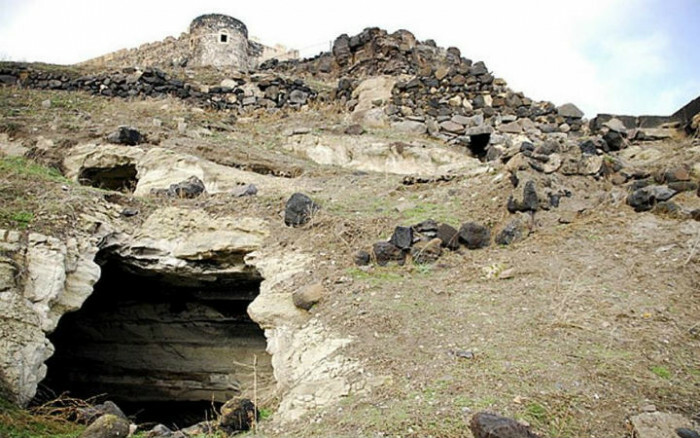 Archaeologists set out to explore Derinkuyu and found that it went 18 stories, or about 200 feet, underground. 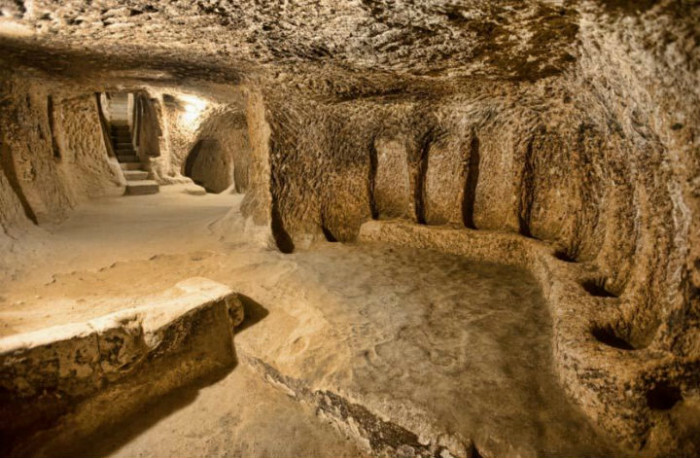 This made it one of the largest underground manmade sites in the world. It was astounding! 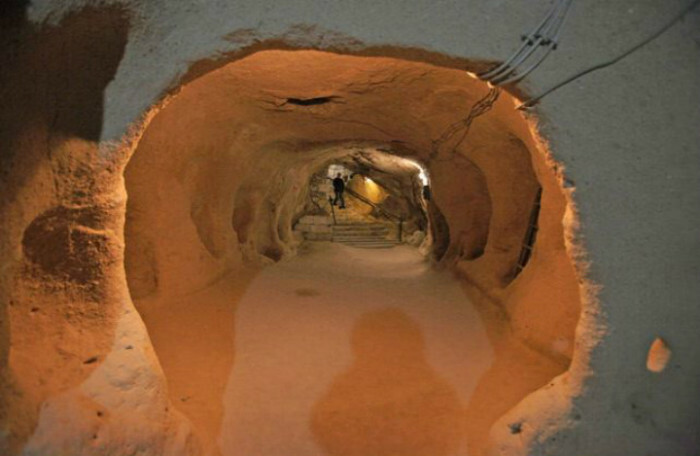 They think that at its peak, could've contained 20,000 people within its cave system. 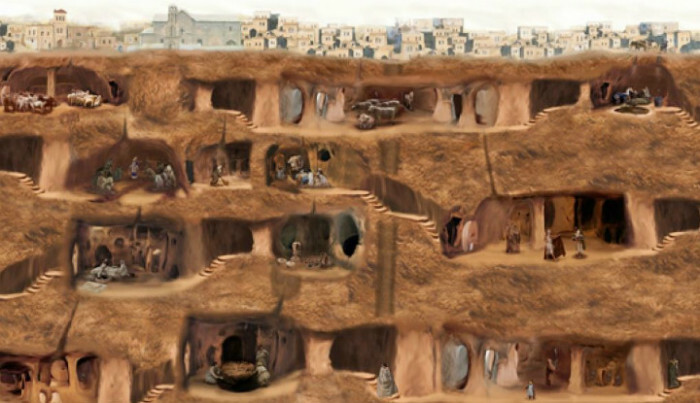 While that is amazing in itself, you may be asking yourself...why did they need to live underground? It's not like Turkey is uninhabitable. When we look back at the history of the area we find that it has been home to many ancient figures. 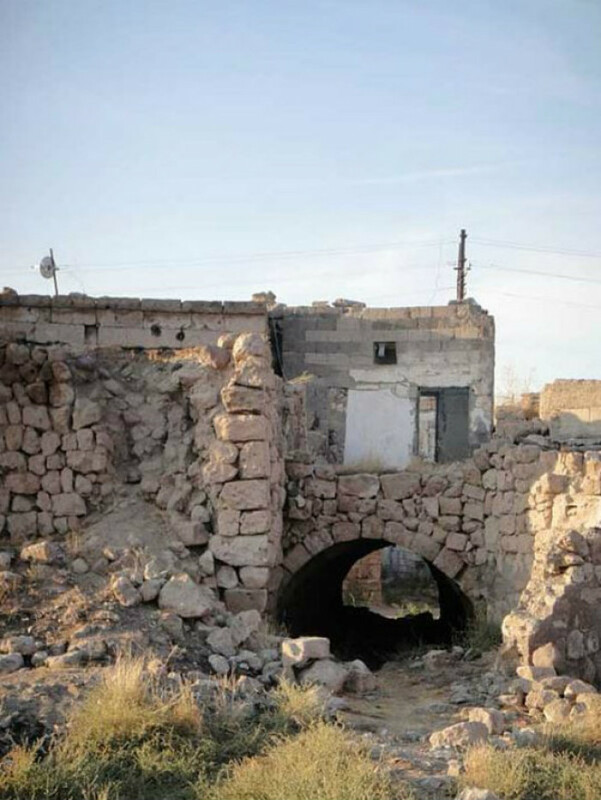 The first people to reside there were the Hittites, who lived above the ground around 1600 BC. After they were no more, the area was taken over by the Persian Empire. 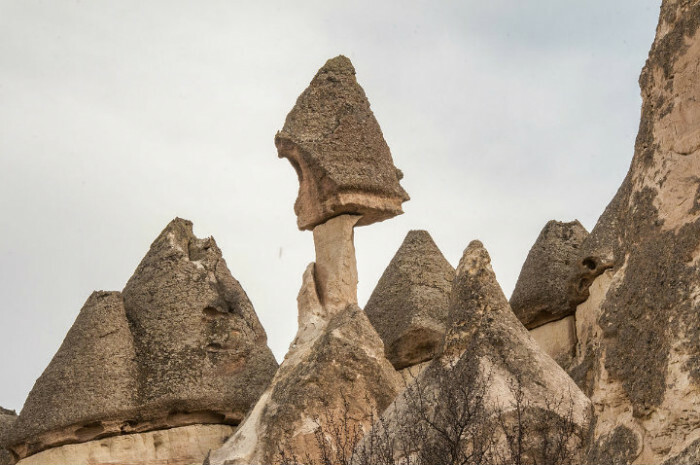 At that time the area was known as Cappadocia, and according to the Bible, was at some point inhabited by Jews. Still, this didn't tell them who had built these strange caves. 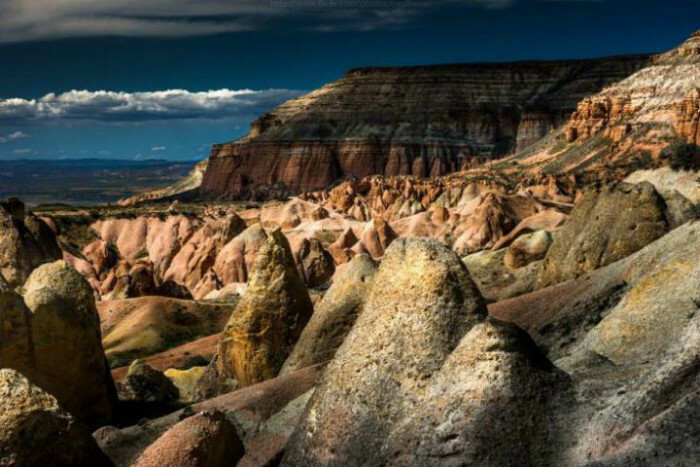 As mentioned above, this area was once known as Cappadocia, part of the region called Central Anatolia. This name dates back to the 6th century BC, mentioned in the inscription of kings of the Persian Empire. The area contains an astounding 14 volcanoes and is around 3,280 feet above sea level. Maybe the volcanoes formed the original cave system? 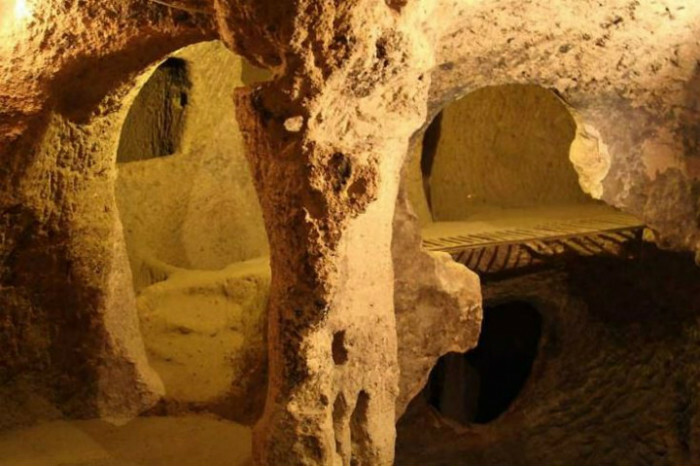 It turns out that the original city of Derinkuyu was both above and below ground. 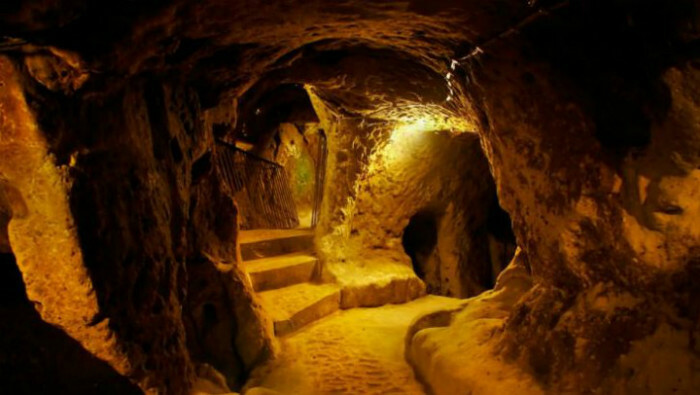 Not surprisingly, the underground part was meant for times of war, as the Arab-Byzantine wars lasted some 400 years. They clearly needed it often. The Byzantine Empire was Christian and the Arab Empires to the south were Muslim, and frequently attached the north. They had to do something to protect their lands. 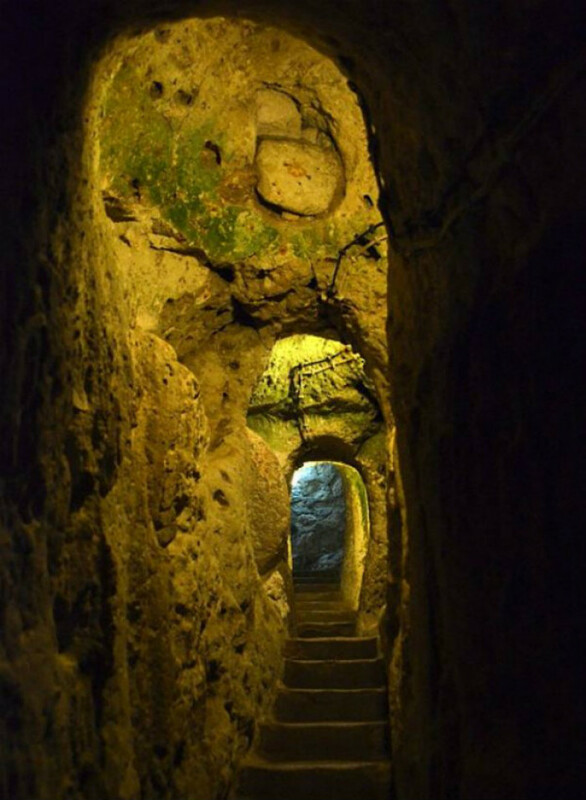 The underground city kept the residents of the ancient city of Derinkuyu safe from harm as Arab armies constantly invaded their region. They were offered some relief during the Muslim Civil War in 656 AD, but the peace was not long-lived. The Muawiyah came out on top, and founded the Umayyad Empire. Not surprisingly, he continued on with the Arab-Byzantine War. They constantly had to retreat underground to keep themselves safe. 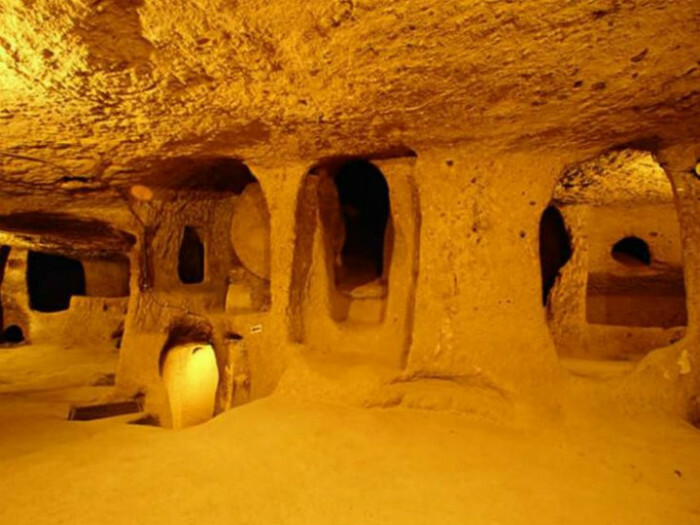 The time of the Muslim Civil War gave Derinkuyu a chance to get their underground city ready to defend itself. The plan was that the above ground city would look like it had been abandoned and that the people had left and taken their livestock with them. You may remember earlier when the man walked through the narrow hallways, that he noted only a singular person could pass through at the same time. This was also a genius idea by the people, who built these entrances so that one person at a time could come in, and therefore had almost no chance of surviving the walk in. That's if they even found an entrance in the first place! There were over 100 of the secret entrances, and all of them were expertly hidden. This single-file theme continued into the rest of the architectural plan of the city, with each of the stairways only wide enough for a single person at a time. These stairways are what connected each level of the city, so the security was paramount to their survival. And just for an extra layer of security, each level of the city had huge boulders sitting next to the entrance of the stairway to cut off the individual levels if need be. In addition to the security system, the subterranean city had an insanely advanced infrastructure. 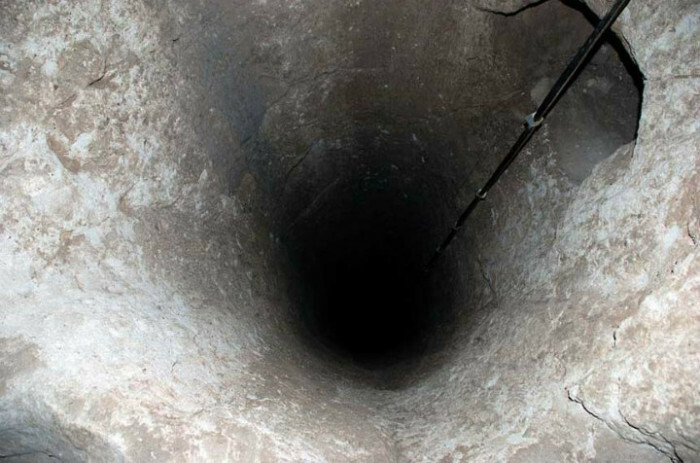 They were able to get fresh water from underground wells that were inaccessible from the above city, providing security against poisoning. They also had a ventilation system that brought fresh air to all 18 of the levels, with ultra narrow vents hidden on the surface. 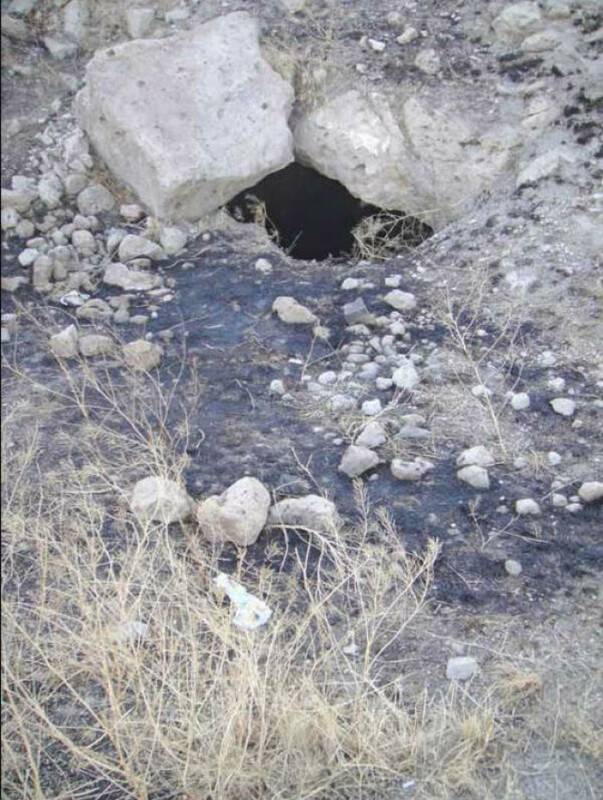 This ventilation system also provided a way for smoke to get out, as electricity was far from being discovered. 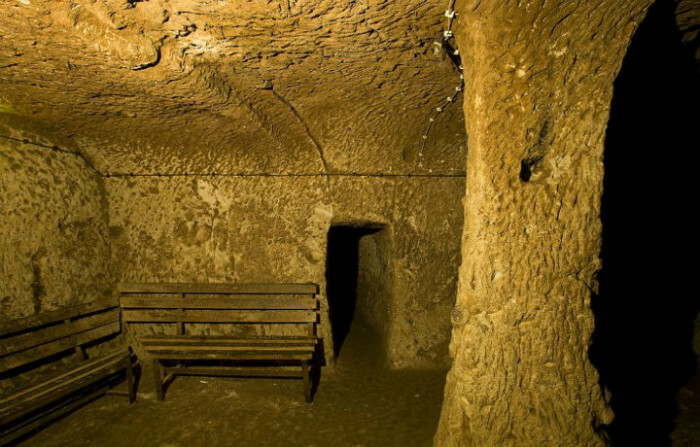 The underground city was noticeably blackened by ash from centuries of secret fires. 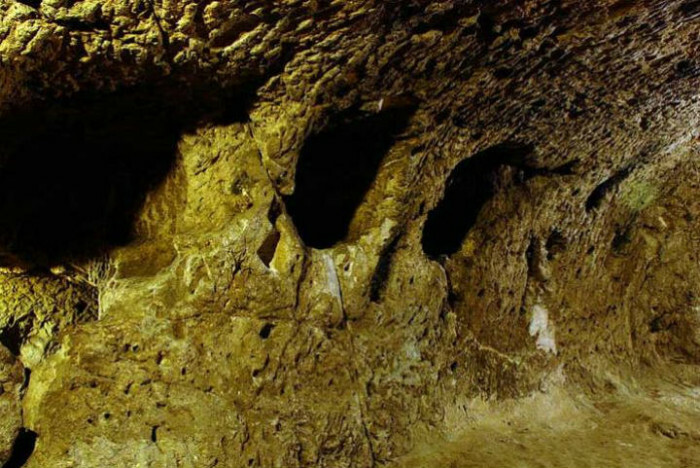 When the people of Derinkuyu had to go underground, they were able to also lead their livestock below to make sure that everything looked completely abandoned above ground. Their entrances were so well hidden that you could walk by one in a courtyard and never see it. 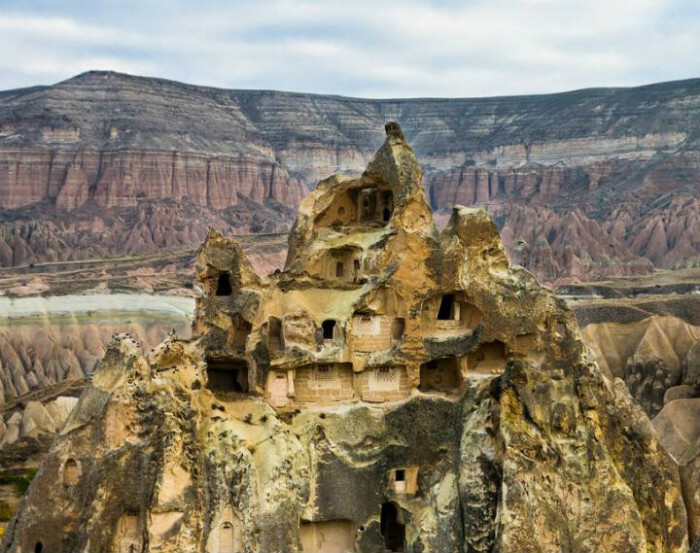 Derinkuyu was not just a home for a weekend hideaway, but a long-term residence at times. 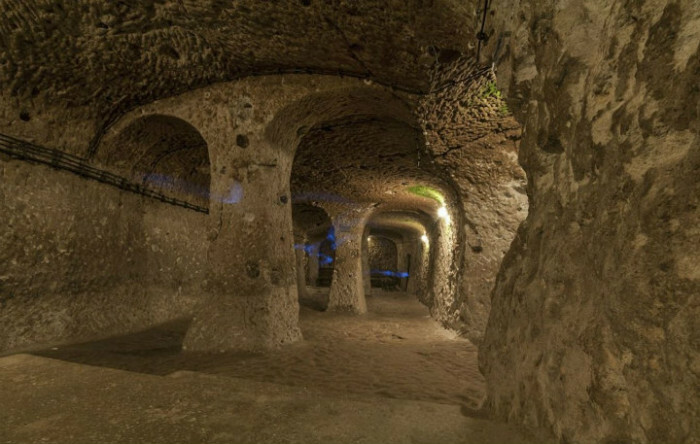 They could sustain life below the surface for huge amounts of time and had such amenities as housing areas, stocked storage rooms, wine cellars, oil presses, classrooms, stables, churches, and stores. They were so prepared that they barely had to pause their lives when they went into hiding. 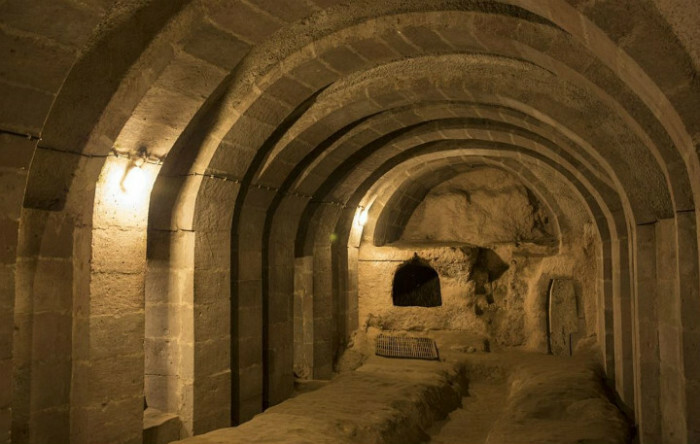 As the wars raged on, the Christian minorities continued to worship underground. They kept their most precious religious artifacts and chapels at the bottom of the cave system, and never stopped their religious studies. This shelter also was used to protect from invading Mongolian armies in the 14th century, so it came in handy a lot. 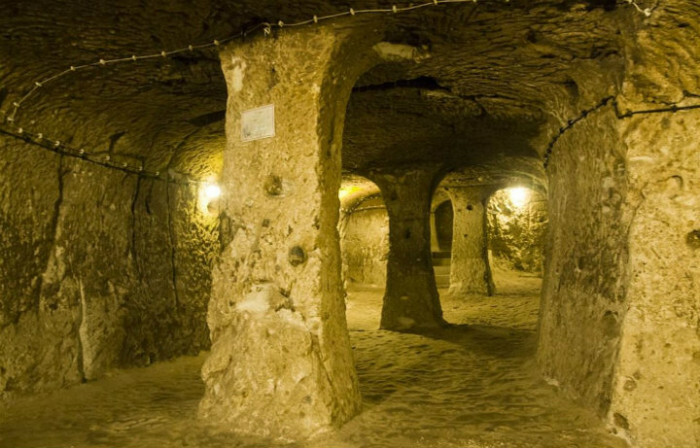 If you thought that was crazy, just imagine 200 more underground cities connected with via underground tunnels. Yup! That was also a thing. Each of these cities had at least 3 levels and people didn't even have to go above ground to get to them. You could leave your city, seal off the tunnel and evacuate to another without ever seeing the sun. Even though they were a clearly advanced people, the Byzantine Empire eventually fell in 1453 to the Ottomans. 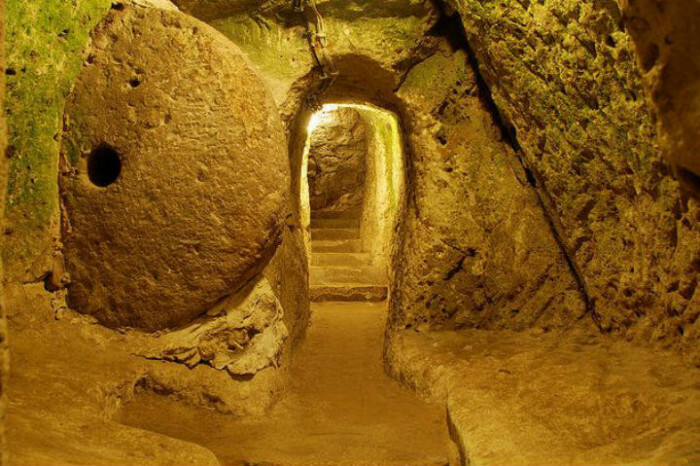 The underground cities were then a critical escape from the new Turkish Muslim rulers with whom they had fought with for hundreds of years. 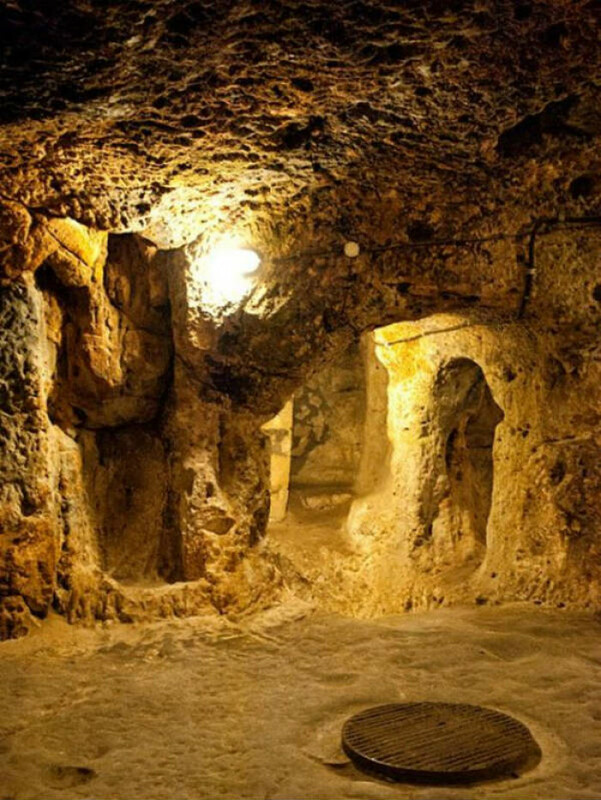 They found that people had used the underground portion of Derinkuyu as late as the 20th century to escape religious persecution. This all ended when all Christians were banished in 1923 to Greece and the cities were left behind. While this is not entirely known, they suspect the original inhabitants of the region, the Phrygians, to be the engineers of this massive project. The first documented existence of Derinkuyu was found in the writings of an ancient Greek philosopher Xenophon, around 430-354 BC. 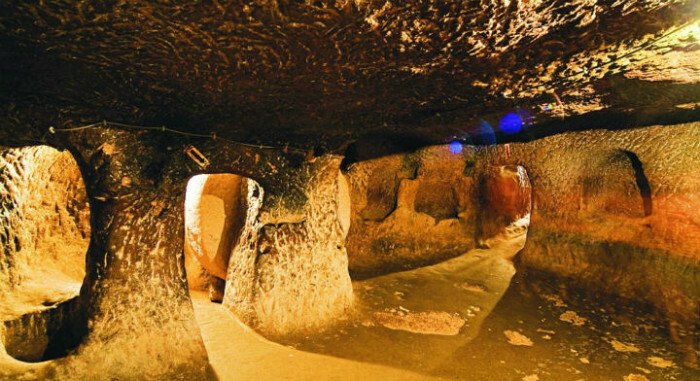 Amazingly so, you can visit the lost city of Derinkuyu and see it with your own eyes. They have opened about 10% of it to the public, beginning in 1969. With it being such a huge underground city, and clearly ancient, they are still working on exploring and excavating the rest of it. Archaeologists still have no explanation for how such an ancient people were so advanced. Obviously, when something historically astonishing happens, there are always people there to distrust why it exists or who built it. Conspiracy theories range from the purpose being to hide from natural disasters to hiding from aliens. 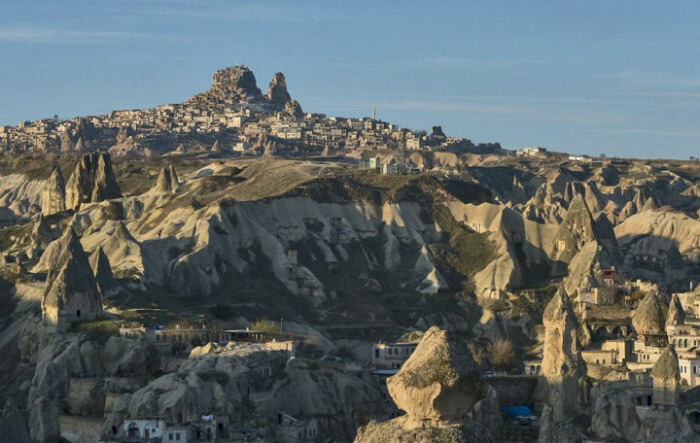 There are even people connecting ancient Zoroastrian texts from 1500-200 BC describing a city that was built under the direction of gods to withstand a catastrophic winter to Derinkuyu. 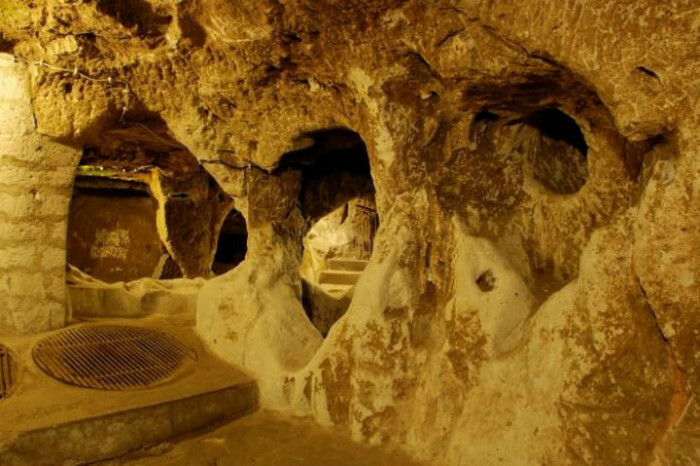 Though the cave system is incredibly famous, the name of the man who discovered it in unknown. He never publicly took credit, just found this massive cave system and changed history forever. Thank you mystery man!